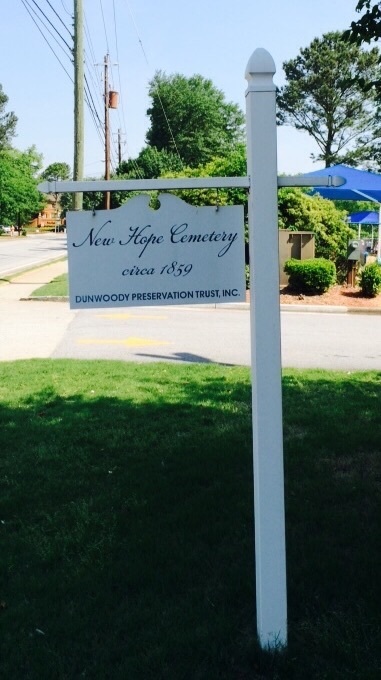 One of the first cemeteries I visited after becoming a Find a Grave volunteer was Dunwoody’s New Hope Cemetery. It’s hard to find unless you know that it’s located behind a KinderCare on Chamblee-Dunwoody Road. Like the Stephen Martin Cemetery near Perimeter Mall, New Hope Cemetery’s care is overseen by by the Dunwoody Preservation Trust (DPT). The juxtaposition of a cemetery with a daycare center may seem a bit strange. But it’s actually not so strange when you realize that just as life is beginning for some, it’s already ended for others. You can see the daycare center behind the sign. On that first visit (probably spring 2013), the cemetery seemed well hidden amid the trees, a pleasant retreat amid the honking cars in Dunwoody Village. It was comforting to hear the excited chatter of little kids playing just over the fence. Later in June, a tornado toppled some of those old hardy trees and made quite a mess. The gates of New Hope Cemetery are locked but there’s a side gate to the right for guests to enter. Unfortunately, the work crew hired to remove the debris used equipment that was too big for the size of the cemetery and ended up knocking over some or the markers and damaging some grave sites. Needless to say, many families with loved ones buried there were not happy. A group that included descendants, Boy Scouts, nearby residents and even employees of a neighboring real estate group gathered in May 2014 for a clean up day. One of the huge old trees that towered over New Hope Cemetery was close to the fence between graves and the daycare center. 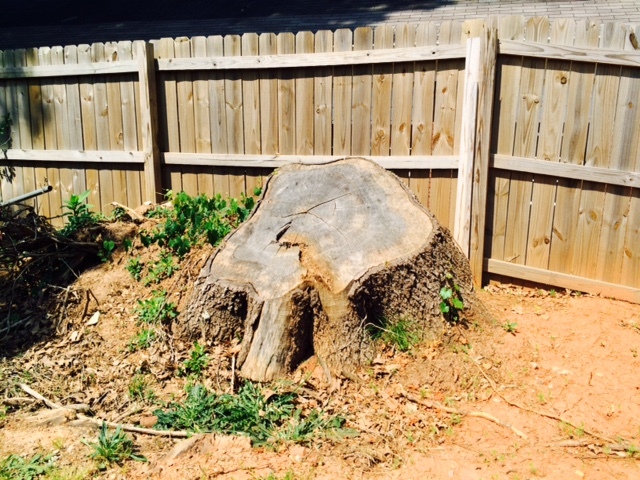 The stump is all that’s left of it now. When I went back a few weeks ago, the feel of the place had changed a bit. The trees toppled by the tornado had been removed so it wasn’t nearly as shady. But considering the photos I saw on the DPT site showing the damage the tornado caused, it looked pretty good. The laughter of children was drifting through the air again. I did notice that a number of monuments that were upright back in 2013 are now face down or off of their bases. I don’t know if all of it was caused by the tornado/debris removal equipment, but it is expensive work to get these kinds of old stones upright and properly reattached. You can’t just glue them back on and walk away. According to a Dunwoody Crier article, Providence Baptist Church was established close to this site in 1852 and members gathered in a slave-built log cabin. Some time after the Civil War, members settled on a location more central to Sandy Springs and Dunwoody so the Providence congregation moved near the intersection of Mount Vernon Road and Glenridge Drive. While New Hope Presbyterian Church was built on the current property around 1887, burials started taking place in 1859. The cemetery’s land was formally donated to the church by the Duke family for that purpose according to an 1888 deed. 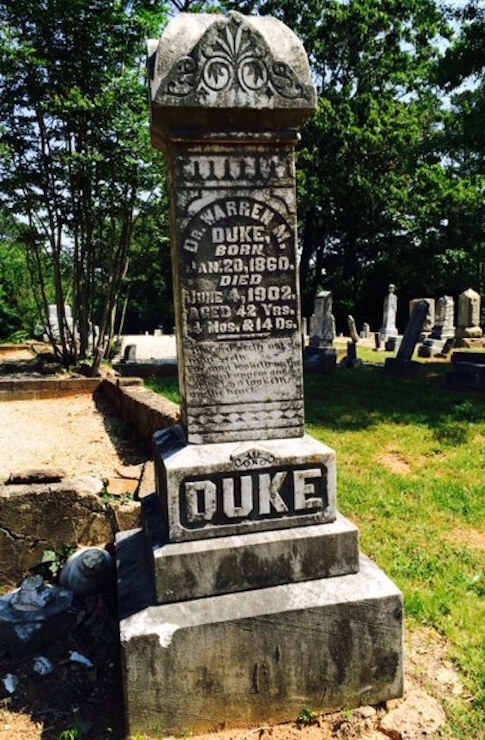 Dr. Warren M. Duke was buried there in 1902. The church disbanded in 1917 but the cemetery that bears its name remains. 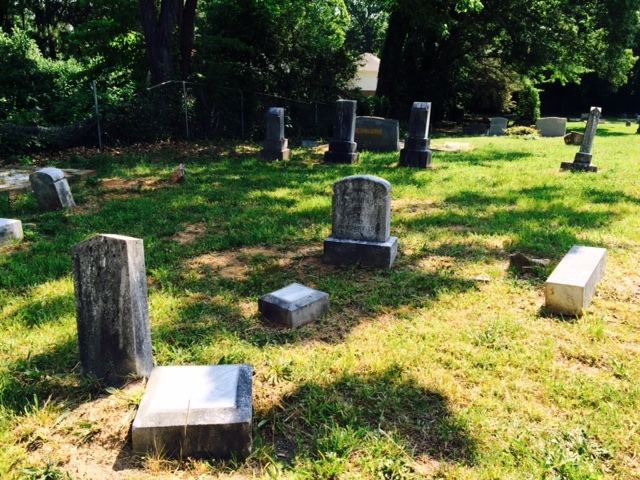 Dr. Warren M. Duke’s family donated the land for New Hope Presbyterian Church’s cemetery. He died at the age of 42 and was reportedly much loved by Dunwoody residents. Having now visited three other Dunwoody cemeteries, I saw that the same names are evident here as well: Ball, Brown, Carpenter, Copeland, Cheek, Spruill. Thanks to a memorial written by fellow Find a Grave volunteer Chryse Wayman, I learned that some of the graves at New Hope Cemetery bear witness to a tragedy that rocked the community. The lives of three men ended on the day before Thanksgiving in 1920 when a steam boiler at the Dunwoody Milling Company exploded. Graham Spruill (30), John O’Shields (44), and John W. Manning (48) all left behind wives and children. Graham’s brother, Bency, was injured but survived. John Walsey Manning left behind a wife and three children when he died due to a boiler explosion at the Dunwoody Milling Company. Photo by Find a Grave volunteer Edward Smith. Located on Mount Vernon Road where a car wash now sits, the plant contained a flour mill, lumber mill and a ginnery. Parts of the boiler were found a half mile from the scene. The explosion’s cause was never determined. The mill was owned by Joberry Cheek, who is also buried at New Hope Cemetery. Joberry Cheek owned the Dunwoody Milling Company, where a 1920 boiler explosion took the lives of three men. Photo by Jan Gold. After my recent post on Ebenezer Primitive Baptist Church, a sweet lady by the name of Freda Donaldson Williams left a comment on the blog about her great-grandmother, Tavie (short for Octavia) Wade Adams. 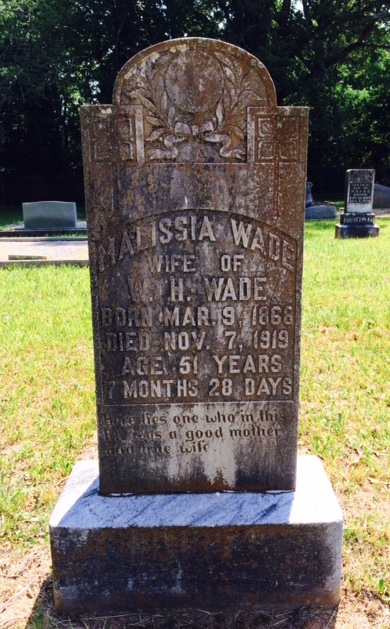 Tavie is buried at New Hope Cemetery along with her mother (Freda’s great-great-grandmother), Malissia Ellen Poss Wade. Freda shared that Tavie died in 1920 when Freda’s grandmother was only six years old, leaving the family to fend for themselves. Malissia had only died a few months before that. Mallisia Ellen Poss Wade died only a few months before her daughter, Tavie. Unfortunately, Tavie’s marker is off of its base and I could not see the front of it. When I visited New Hope Cemetery, I made sure to look for both Tavie and Malissia’s graves. I did find Malissia’s but Tavie’s marker appears to have toppled from its base. I did not lift it up for fear of causing further damage. 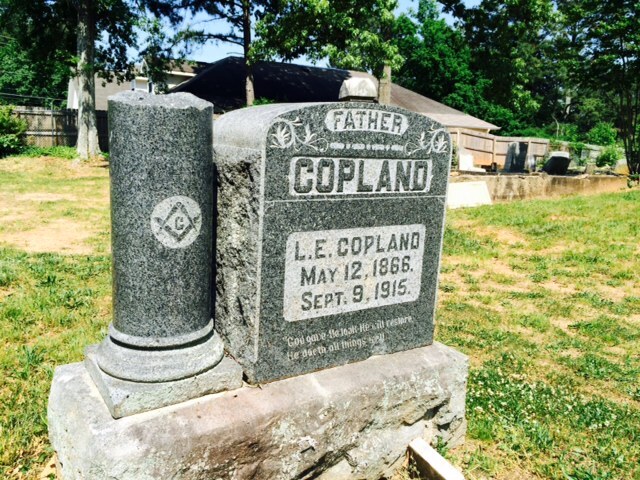 One of the more elaborate markers at New Hope Cemetery is for Larkin E. Copeland (spelled Copland on the stone). He was a farmer and at some point owned a store. It features a broken column and a Masonic emblem. Usually, a broken column means a life cut short. But in freemasonry, it is also meant to represent both the fall of Master Hiram Abiff as well as the unfinished work of the Temple of Solomon. I know little about the Masons but you can read about it here. A broken column usually means a life cut short, but in this case it probably has roots in Larkin Copeland’s Masonic membership. 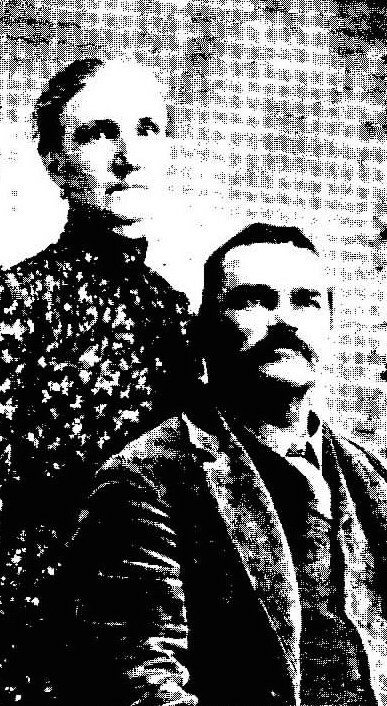 This is an undated portrait of Larkin Copeland and his wife, Lavada Ball Copeland. Lavada is buried in Southwest Atlanta at Westview Cemetery, as is their daughter, Grace Copeland Blackwell. Photo from Ancestry.com. Finally, there is a stone for two children close to the front gates that I suspect is not where their graves are actually located. 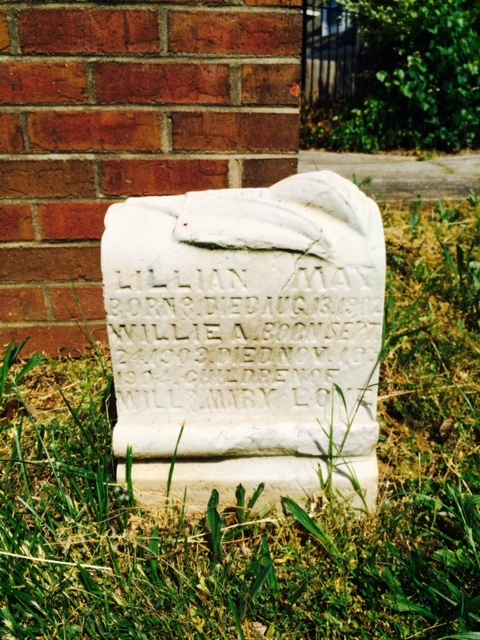 According to the stone, Lillian May Love was born and died on August 13, 1902. Her brother, Willie Love, was born Sept. 21, 1903 and died Nov. 10, 1904. Both were children of William and Mary Love, for whom there are no markers in the cemetery. Considering the fact that children today come to this spot to laugh and play is both sad and uplifting at the same time. Even in the face of death, life does go on. Infant Lillian May Love only lived a day while her brother, Willie, lived a little over a year. Their parents’ graves are either unmarked or located in a different cemetery. 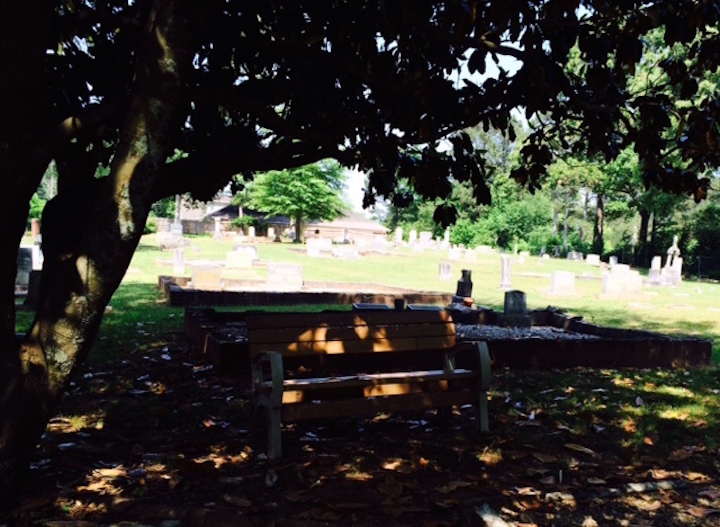 So the next time you’re in Dunwoody Village and you need a little break from the gridlock, walk over to New Hope Cemetery and make yourself at home on a bench. The laughter of the children will greet you at the gate. another great post Traci. Makes me want to visit there! 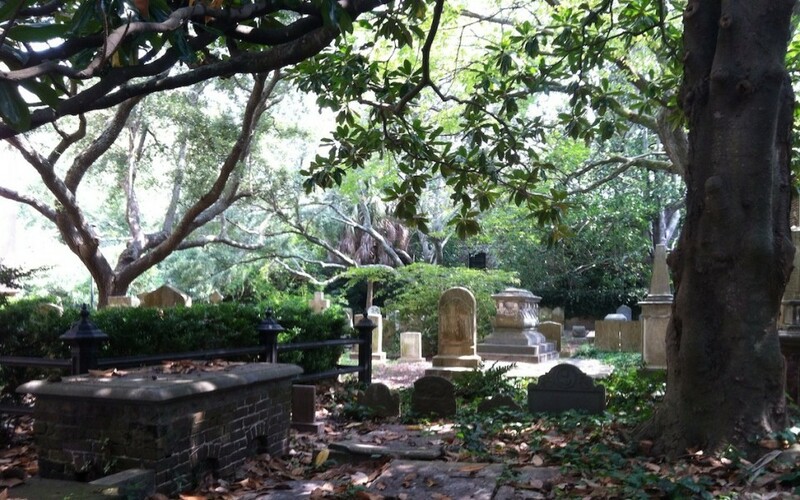 I love this information about lost cemeteries and their history. Thank you for your hard work in investigating their history. If u are ever in Mn, find a cemetery and write a post!! Thank you for the article on New Hope. I do need to make a correction though. Tavie Wade Adams was my ggrandmother (d 1920) and Malissia Poss Wade was my gggrandmother. My grandmother Nancy Ellen Adams was the little girl left to cook for her 2 brothers and father. She died in 1990. Do you know if the Preservation Trust is going to check on the toppled stones? Is there a way we can check? Thanks for the correction, I will make the changes to the post.. I have no idea if or when the DPT is going to do any repairs at the cemetery. I would give them a call to see what their plans are. My great-great grandfather, Mr. Manning, was the gentleman killed in the Cheek Mill explosion. I am currently researching his family to learn more. Several of his sons are buried in New Hope in unmarked graves, along with an infant grandson named Roy. I am currently working on having a marker placed in New Hope for my great-grandfather, Alonzo Manning. Thank you for the article. I enjoyed reading it and will pass it along to other family members. I would be happy to be of any help if you ever decide to do another post on New Hope or the Manning family. Hi, Kelly! I would love to read anything you find out, the Mannings are a big part of Dunwoody’s history. If you know more about New Hope, I’d love to share it with my readers. Thank you! 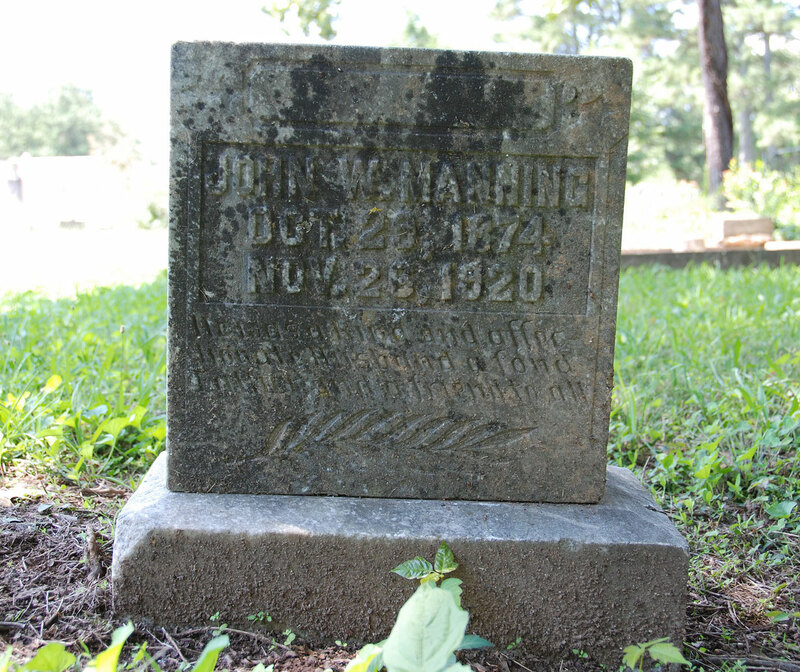 Mr. John W. Manning was my great-grandfather. He had a son named John Henry Manning who is my grandfather. My sister is also researching our family to find out more. My mother’s name is Joyce Ann Manning Pinyan and as a child I remember her talking about your great-grandfather Alonzo. Now that my sister has told me about her “find” on our family it has gotten me interested in learning more! My grandparents, Nevetta and Larkin Turner are buried there. So are my great-great grand parents Warren and Julia Manning. 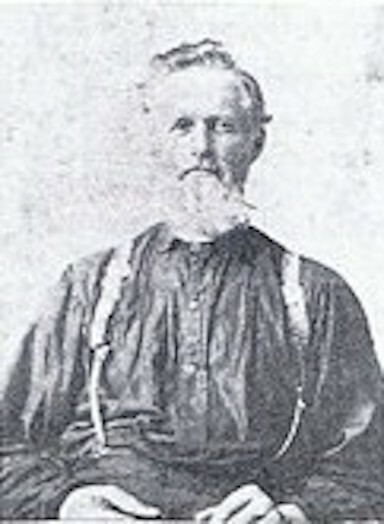 Larkin was the son of Amy Manning and Charlie Turner. She later married David C. Loner. I cannot find where she is buried. Have you come across her name by chance?